Thankyou for the support and feedback. ATL is no longer updated but please enjoy past stories. Artravelife was a collaboration between arts & travel writer Susie Burge and graphic designer Michael McCorry of The Eleventh Hour. I first came across Kate Tucker last year when Brisbane’s Edwina Corlette Gallery posted a covetable series of abstracts on Facebook, then swiftly announced that this new solo exhibition of paintings had sold prior to opening. (Bugger.) 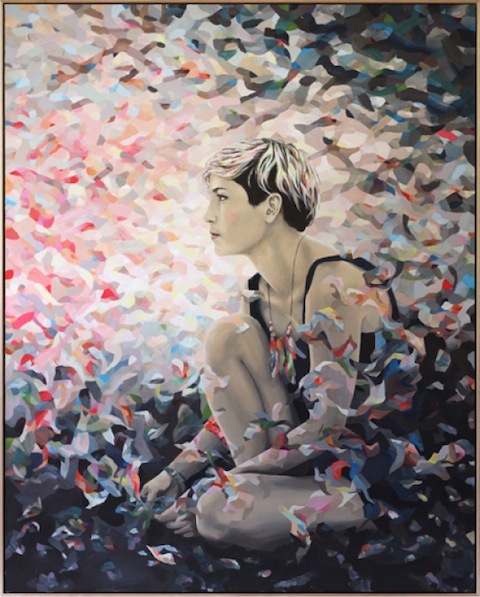 I next came across Tucker at this year’s Archibald Prize, when the artist attracted public attention with her portrait of Missy Higgins. Now, Kate Tucker’s work is appearing on billboards around town. She created the cover artwork for Missy’s chart-topping album, distinctive painterly gorgeously-coloured fragments swirling and coalescing, almost 3D in sense, some surrounding the subject, some freely their own landscape. This week, the artist’s exhibition of new paintings – her third solo exhibition – is due to open at Helen Gory Galerie in Melbourne.